Communion M&M Tubes Favors - Personalized First Holy Communion M&M Tubes Party Favors, Ideas, Supplies & Gifts. Celebrate your child's First Holy Communion with our personalized M&M Tube favors, that can be customized just for you're special religious event. 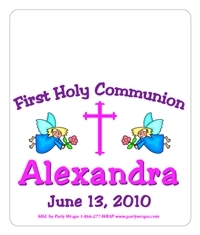 Communion M&M Tube favors are among our most popular First Holy Communion favors. We can personalized any of our M&M Tube label designs with a photo, event colors, or special graphic.